Pro: The 25% tax on steel and 10% levy on aluminum will save American jobs. Con: The new tariffs will destroy American jobs. This was essentially the discussion I recently had with Tim Donner, Washington Political Correspondent at Liberty Nation, as part of a feature called Point-Counter Point. We must have free trade! 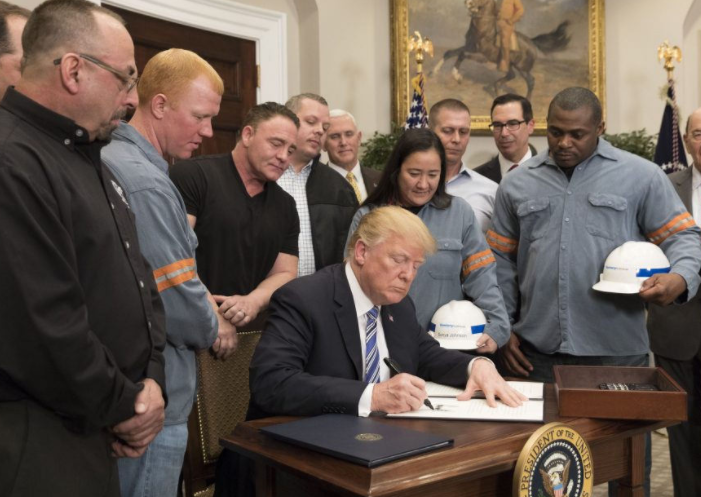 That is the plaintiff wail of many or most conservatives and libertarians aghast at the tariffs on steel and aluminum announced in recent days by President Trump. Among them is my colleague Andrew Moran, who took to LN to excoriate the President on this move. Allow me to respond to his lamentations. To many or most free-market types, you are automatically a protectionist and not a “free trader” if you favor any tariffs on any industries at any time (or oppose NAFTA). It’s almost like the Pavlov’s Dogs-style response of leftists who cry racism any time you criticize someone who happens to be black. Mr. Moran rightly states that “The U.S. imports four times as much steel as it exports from more than 100 countries.” This leads to a basic question: do you want an American steel industry at all? Or are you fine with the US relying almost strictly on imported steel? Because those are essentially the long-term stakes in play, and the reason – along with, of course, national security – that Trump made the decision to slap tariffs on imported steel. Fact is, there’s a global steel glut, so we can decide to just allow excess supplies to flood the US market, or take action that allows our shrinking steel industry to survive and ultimately thrive to the greatest extent possible. You can read my response here.